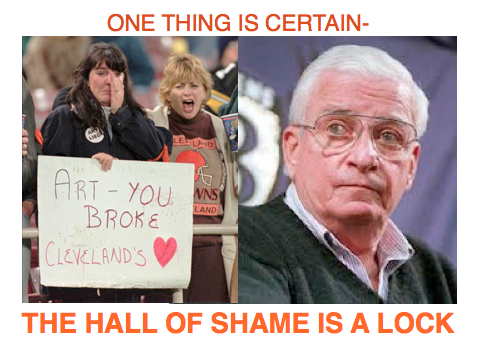 Browns fans just don’t find themselves cheering this time of year for anything football related. After all, the Super Bowl is only a day away. However, today I must say that I pumped my fist in the air and gave out a rather loud “hell yes” upon hearing the news that “Benedict” Art Modell won’t be inducted into the Pro Football Hall of Fame in Canton, Ohio. Fans of other teams may say that Browns fans need to get over what Art did to the city of Cleveland, but they weren’t there. They didn’t grow up loving the Brown and Orange. They haven’t suffered through years of rebuilding and horrible football since the team left. Yes, justice was served today and Browns fans can breathe a sigh of relief. We’ll take anything we can get.